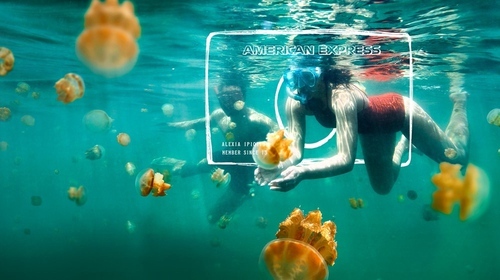 Amex originally had lots of different images for their latest Explorer card. I’m having trouble remembering what they were, because anecdotally all I’ve seen lately is this particular one on public transport, billboards, and such. Their market research must have indicated its holiday imagery had the most impact. 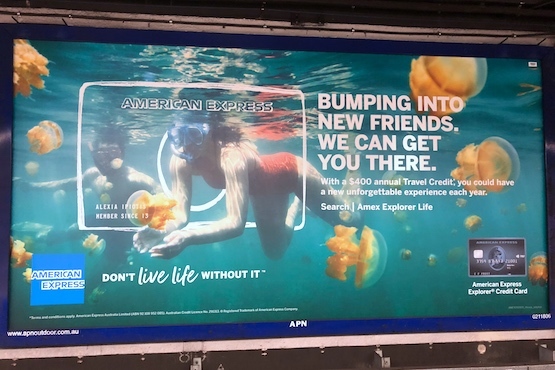 I’ve had nothing but positive experiences with Amex themselves; the only negative ones were with social media trolls. But the idea of being stung by a charge card company doesn’t seem appealing. Maybe these jellyfish are harmless. Maybe those swimmers are marine biologists, navigating the waters of personal credit to avoid late payment fees and interest. But not everyone is a marine biologist, and could find themselves in trouble if they don’t always have the funds in their bank account to pay off the card in full at any time. Wait, now I see what they did there.